Chairman and CEO Chuck Robbins believes we can solve the world's biggest problems. Two years ago, Cisco's SVP of Corporate Affairs Tae Yoo made what Chairman and CEO Chuck Robbins calls a "bold declaration." She announced Cisco would positively impact the lives of one billion people by 2025 through its Corporate Responsibility Programs. Over the last two years, that impact has come in the form of partnerships with groups like Water for People, which helps thousands of people worldwide get access to safe drinking water, and Cisco Networking Academy which trained almost one and a half million people around the world in one year alone. Then there is work with partners like NetHope, which alongside Cisco employees restored connectivity in Puerto Rico after Hurricane Maria devastated the island. And the list goes on. Every single person at Cisco is a Global Problem Solver in one way or another. Cisco employees recently gathered to hear an update on the company's efforts around the world, and to learn more about what they can do to get involved in their communities. At the Revealed Series, a regular Cisco forum that enlightens employees on different topics, employees heard from Yoo, as well as Robbins, who shared his personal passion for giving back. "If we inspire one other company to join us, or we inspire someone to give a little more money or time, that's important and that matters," said Robbins. Yoo provided an update on work to meet the goal and said the company has so far touched 232 million people, an impact she attributes to technology and passion. 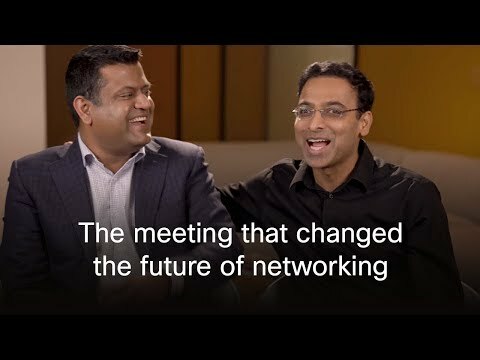 "Cisco believes in creating more opportunities for everyone. It's who we are. Every single person at Cisco is a Global Problem Solver in one way or another. We have amazing people with technical expertise, passion and commitment." said Yoo. Robbins also highlighted Cisco's work with Destination: Home, and the $50 million commitment Cisco has made to end homelessness in Silicon Valley. He interviewed Jen Loving, CEO of Destination: Home, and Summer Bettencourt, a woman who was formerly homeless. Summer lived on the streets with one child and was expecting another. Now she lives in a house, is married, has her bachelor's degree, and works to give back to those who gave her the strength to overcome homelessness. Bettencourt choked back tears as she told employees that she had suffered a lifetime of abuse. She credits the help of many to turn her life around, including Jen Loving. "I was a single mom, homeless, with one on the way when I met Jennifer, I had no direction and no idea what I was going to do. My dream was to give back to people who helped me." said Bettencourt. Although Cisco's partnership with the organization is in early stages, Destination: Home said Cisco's public commitment has already helped lead to two upcoming housing developments homeless individuals and families. Robbins said the public sector can't solve these types of issues on its own, and businesses need to take the lead on solving some of the world's most pressing problems. "In Silicon Valley, we invent things people never dreamed possible, why can't we do that for some of the problems that exist?" said Robbins. Cisco will further its mission to impact lives around the world in the coming months, as it joins with Global Citizen and some of the biggest stars on the planet at three different music festivals. Tickets to the events are free through a drawing. To qualify, entrants have to complete a series of steps that aim to end extreme poverty around the world. Giving back is core to Cisco's culture with employees volunteering 358,000 hours in fiscal year 2017. The company also encourages people to follow their passion for volunteering offering 40 hours of PTO a year in its Time2Give program, something Robbins also mentioned with a call to action for employees. "Think bigger, in business and corporate social responsibility. If you have a passion, pull some friends together and go do it."